Paint spray booth facilities are considered to be a hazardous location due to the presence of flammable compounds from the use of paint and chemicals during operations. Such hazards are also present during maintenance, especially when using acetone to clean excess paint around the area. In order to minimize risks associated with explosions and fires, businesses in the sector must closely adhere to guidelines related to lighting, booth configuration and air filtration. Bright, shadow-free lighting is required for paint spray booth facilities. Primary factors in achieving optimal lighting conditions inside the booth includes the size of the work area and the distance between the fixtures and the target area. The most common lighting configuration inside a paint spray booth incorporates horizontal and vertical lighting. Tubes, in groups of two, four or six, are mounted and separated through a tempered safety glass. A minimum of six inches of space is needed for consistency. 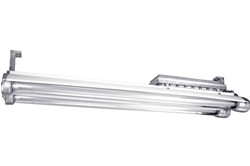 The downfall with only having vertical lights is the presence of shadows when workers step into the fixture’s beam. Adding horizontal lighting addresses this issue, allowing just enough light to pass around the individual during operation. Foot candles must also be taken into consideration, with the industry standard being 100 to 150-foot candles at a height of three feet. To ensure accuracy during paint jobs, lights with specific Color Rendering Index (CRI) ratings are needed. CRI is measured on a scale from one to 100. The higher the rating, the better the fixture is at depicting the true color of the objects in the target area. Incandescent lamps come with a CRI rating of 100, because they are able to reproduce colors of their spectrum accurately. However, this does not mean they are high-quality fixtures. By comparison, LEDs support CRI ratings between 80-92. The light’s color temperature must also be taken into consideration when selecting paint spray booth luminaries. Like CRI ratings, it is recommended to use fixtures with high color temperature ratings (measured in Kelvin[K]). As a basis for how light appears on a color temperature scale, lights with 2,700K ratings emit a warm, yellowish light similar to conventional incandescent light bulbs. While lamps with 5,000K ratings appear bright (almost bluish) and sunlight-like, matching the natural appearance of daylight. In application when combining CRI and color temperature factors, it is best practice to use lights with a CRI rating of 85 or higher, and color temperature ratings between 5,000-6,500K. Perhaps the most important aspect that cannot be overlooked when purchasing paint spray booth lights is safety. Fixtures with Class 1 Division 1 ratings must be used to prevent fires and explosions in the hazardous work location. Article 500 in the National Electric Code manual elaborates on the coverage for C1D1 luminaries, indicating that the lights are applicable to areas where concentrations of flammable gases, liquid-produced vapors or combustible liquid-produced vapors may continuously be present in the facility. This also includes instances where ignitable elements could exist frequently above their flash points due to repair work or leakage. The special fixtures may prevent explosions during workplace accidents, faulty operations or failure of equipment- all of which could cause a device or machine to become a source of ignition. The term explosion proof refers to the fixture’s ability to contain dangerous sparks or explosions inside the unit, where it cannot escape or react with hazardous substances outside of the device. C1D1 lights are required because certain types of paint that uses alcohol, aromatic hydrocarbons, petroleum distillates, acetates or turpentine, are highly flammable. Furthermore, when applied using a spray paint gun, the concentration levels of the flammable compounds increase rapidly. While explosion proof lights are the most common types of paint spray booth lights, other explosion proof equipment is needed to promote quality airflow (stagnant air is a salient factor in the build-up of ignitable particles), power devices and communicate with workers in the facility. Other regulations that govern the technical requirements for paint spray booth lights and equipment includes National Fire Protection Association (NFPA) Standard Number 33, NFPA 86 covering the Standard on Ovens & Furnaces, and Occupational Health and Safety Administration (OSHA) CFR 29.1910.107. In addition to paint spray booth lights, other appliances in the facility must also come with explosion proof capabilities. Explosion proof fans and blowers with C1D1 ratings that move air around the booth are essential in the process of getting rid of toxic and flammable compounds in the area. The type of airflow that operators must create is called laminar air. This type of air moves paint overspray away from the object during refinishing and paint curing. Ideally, the flow of air should cover the object during operation. Air also needs to be filtered adequately, and clean air must be reintroduced back into the work area to offset the concentration of flammable elements. Pre-filters and high efficiency intake filters are utilized to trap stray and dangerous particles before it enters the booth. The air may also be filtered in other parts of the air-cleaning process, such as before re-circulation or exhaustion. Explosion proof ventilators and blowers can be used to streamline the cleaning of contaminated air in the facility. When dealing with a pressurized paint booth, air flow must be carefully regulated. To maintain “pressurization,” operators are required to monitor air levels inside and outside of the applicable work area. For such paint spray booths, it is recommended to keep the air positive, i.e., the amount of air coming into the room must be slightly higher, compared to the amount of air leaving the area. This positive airflow configuration prevents debris and flammable particles from entering the booth. Furthermore, with air trying to leave the booth, any leaks in seals or unsealed panels pushes air out, instead of acting as a vacuum- thus, not contributing the concentration of ignitable substances. Factors that affect airflow includes items inside the booth (volume) and the condition or efficiency of exhaust filters.